Driving directions: On Lenora's Main Street, go south to first curve; approximately one mile. 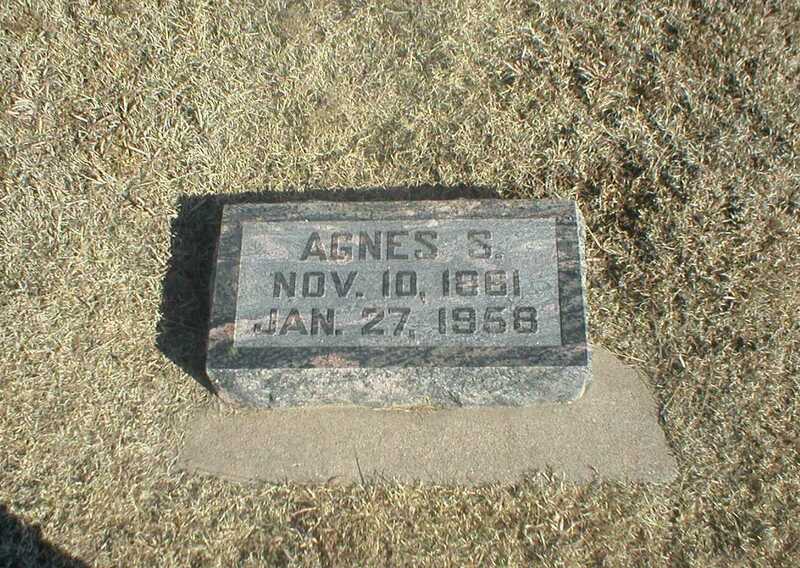 Historical Information: The first known burial is that of Agnes Scott in 1883. 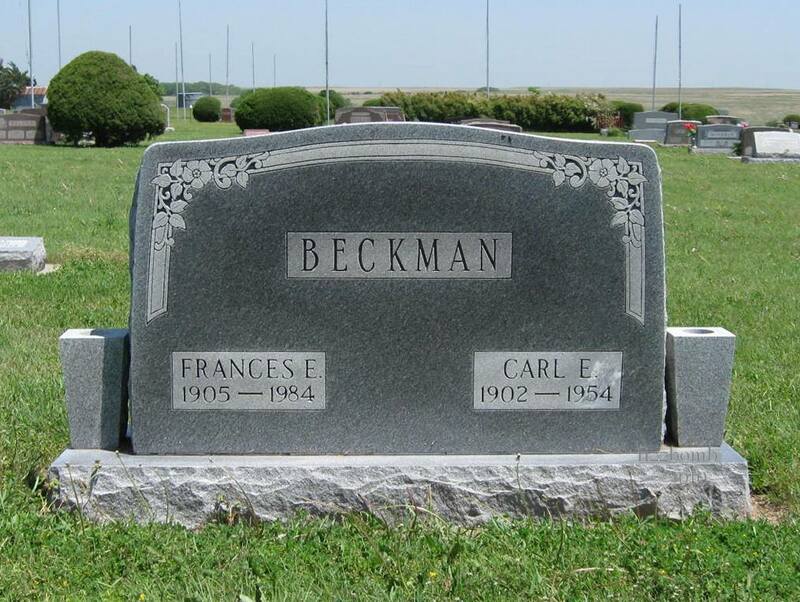 Family members had an original cemetery deed for Block 2 Lot 100 in Pleasant Hill Cemetery dated 1885. 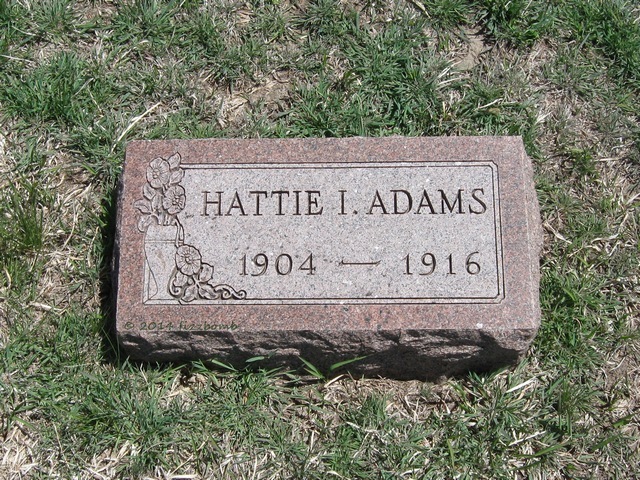 Since the burial was in 1883, subsequent investigations into deeds and land purchases reveal Pleasant Hill Cemetery lies on property that originally belonged to Adam Scott, brother of Agnes, leading to the possible conclusion that Pleasant Hill Cemetery was planned around Agnes' grave. 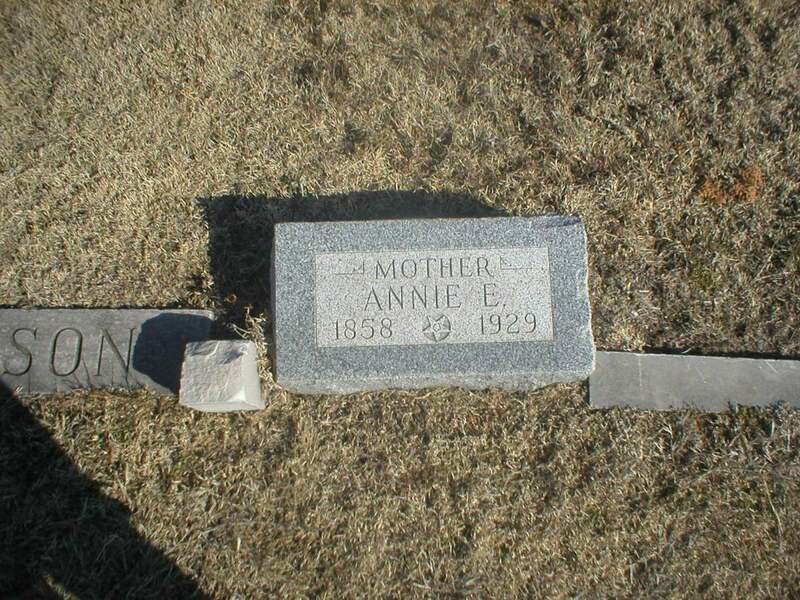 Apparently the cemetery name was changed to Lenora South Cemetery in 1898. Adams	 Duane Phillip	 1/5/1931	 1/9/2007	 Married 4 March 1989	 Military service. Same stone as (living) Adams. 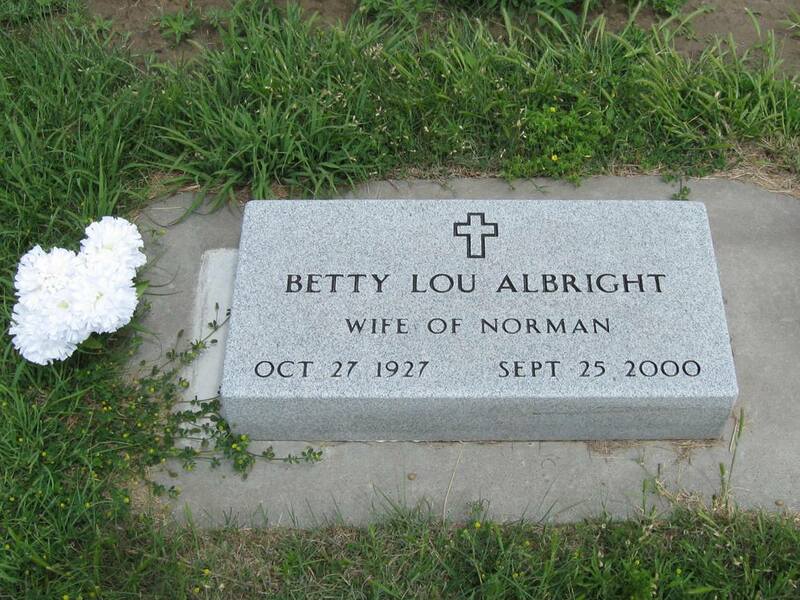 Albright	 Betty Lou	 10/27/1927	 9/25/2000	 Wife of Norman	 Daughter of Grover E and Sarah E. "Sadie" (Hodge) Williams. Wife of Norman. Allen	 Edith M. (Wiltfong)	 10/28/1922	 9/14/1989	 Married March 13, 1942	 Same stone as Harold L. Allen. Eastern Star emblem. 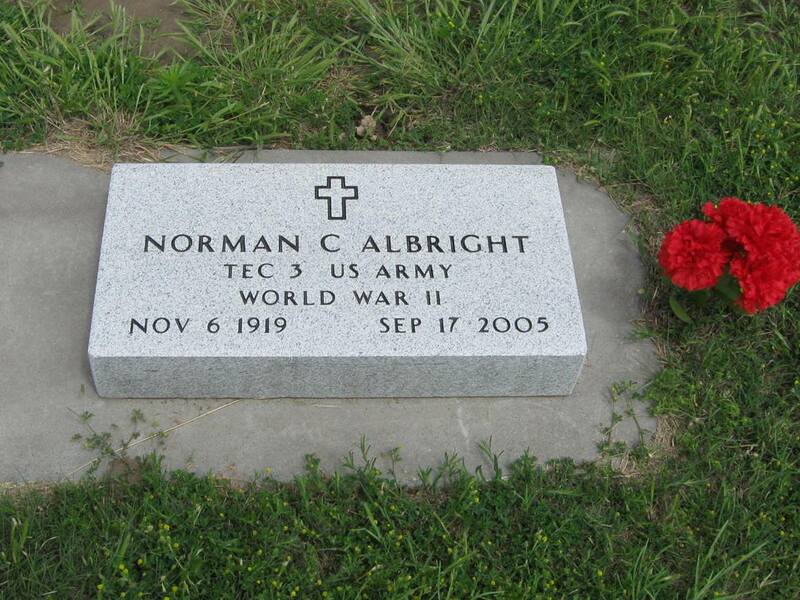 Allen	 Joseph H.	 9/1/1924	 9/17/1999	 World War II emblem. Grandson of J.W. Hayes in same plot. Allen	 Leonard L.	 1894	 1945	 Same stone as Albert J. Clydesdale and Bertha Allen Clydesdale. Alsdorf	 Orville G.	 1881	 1973	 Father; Married 3/29/1917	 Same stone as Lula R. Alsdorf. Alsdorf	 Charles, M.D. 1855	 1900	 Father	 Father of Orville G. Alsdorf. 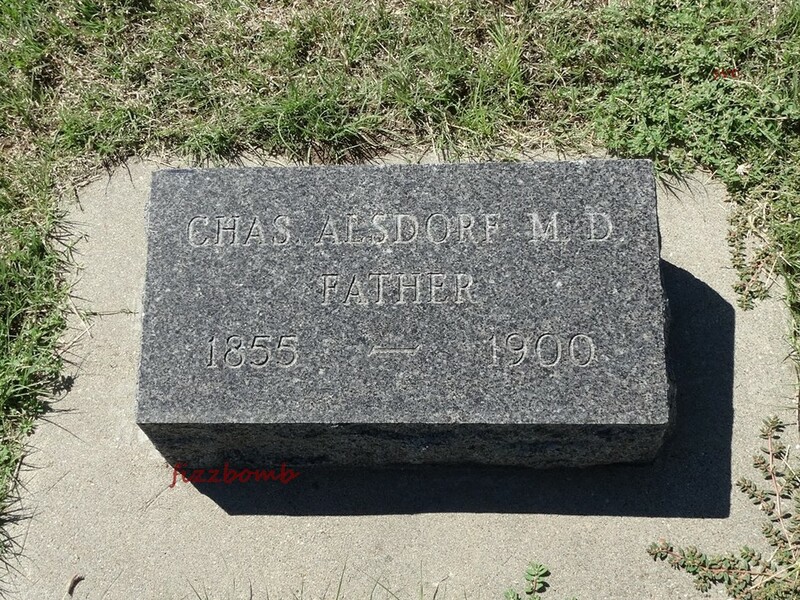 Family source states: Dr. Alsdorf's given name was William H., "Charles" was only a nickname. The stone was made many years after his death and no one could remember his actual birth and death dates. 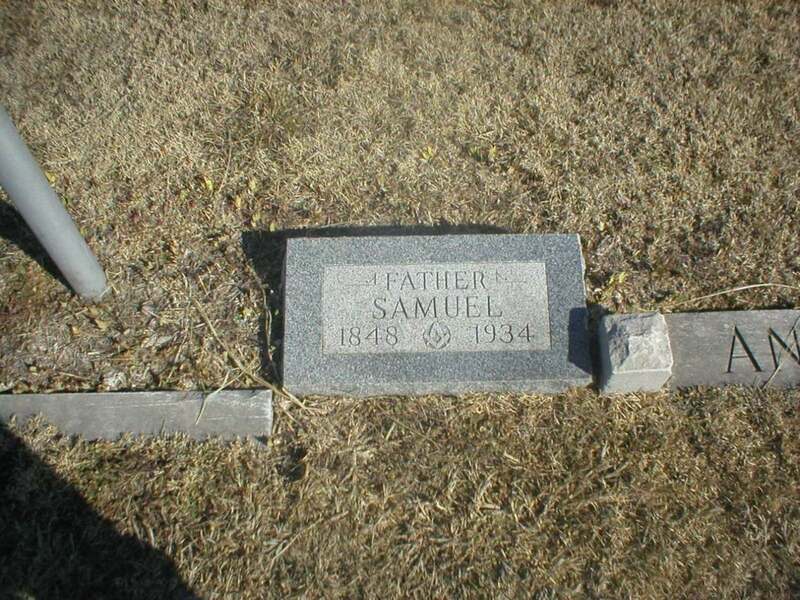 Research by family reveals he was born 25 May 1836 in Spartansburg, Crawford Co., PA and died 18 August 1899. 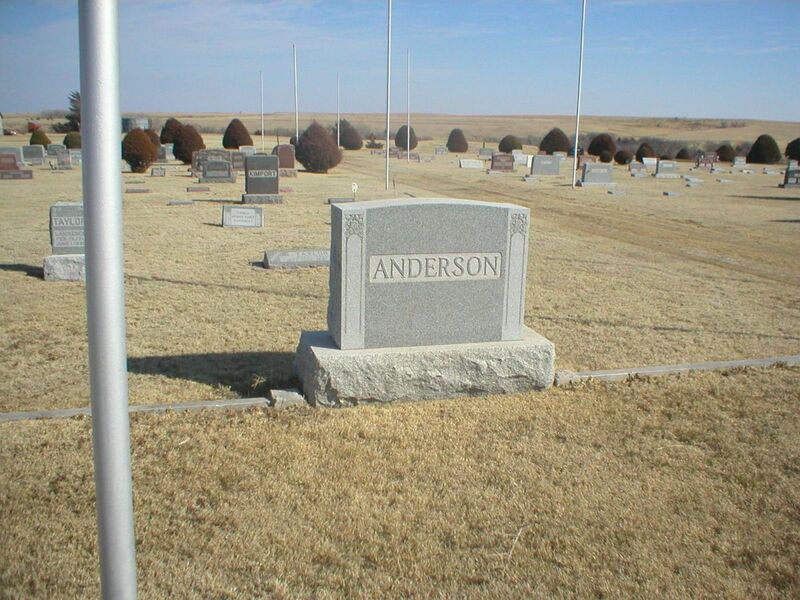 Anderson	 Annie E.	 2/2/1858	 2/28/1929	 Mother	 Large ANDERSON family stone; individual footstones with names & dates. Eastern Star emblem. Obit on file at Norton Co. Genealogical Society. Anderson	 Jos. 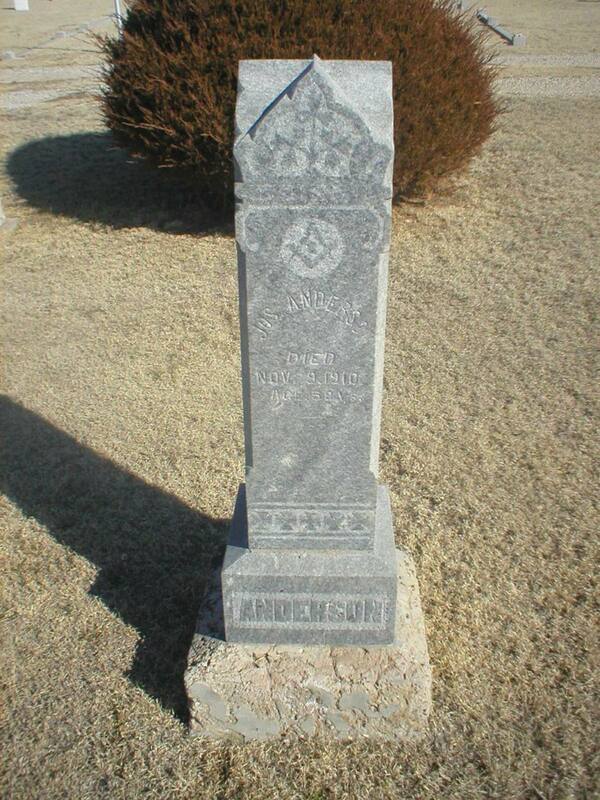 11/9/1910	 Aged 58 years	 Mason emblem. Anderson	 Lucina	 1897	 1979	 Husband was Carl G. Anderson born 1910; not buried here. 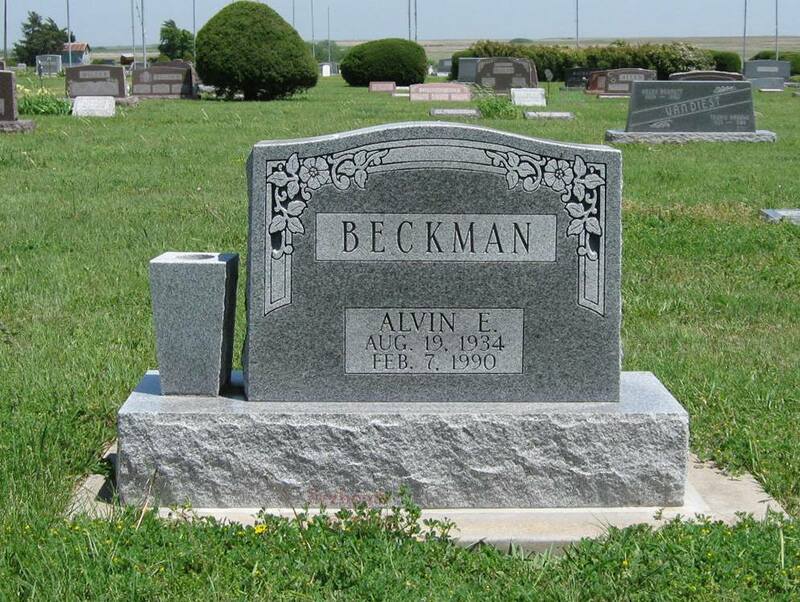 Mother of Alvin Emmons. 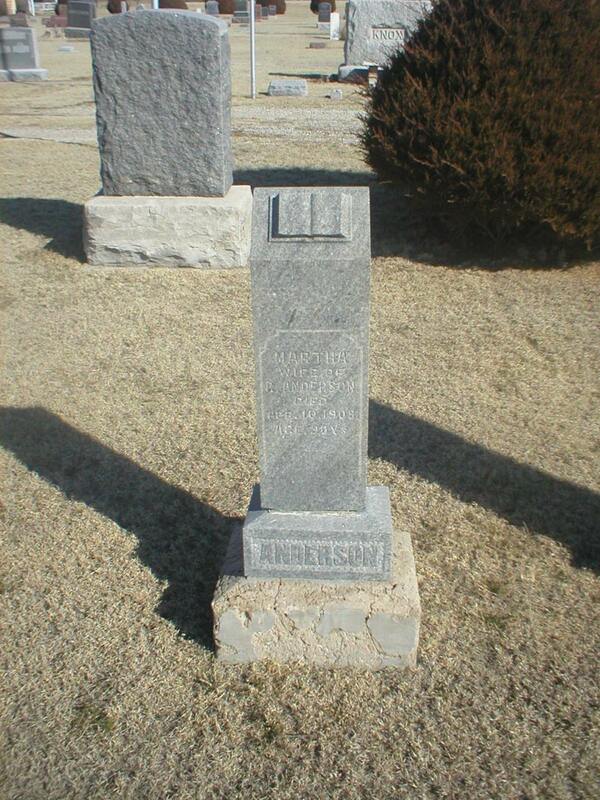 Anderson	 Martha	 4/10/1908	 Wife of R. Anderson; Aged 90 years	 Stone is loose. Lived south of town with son. 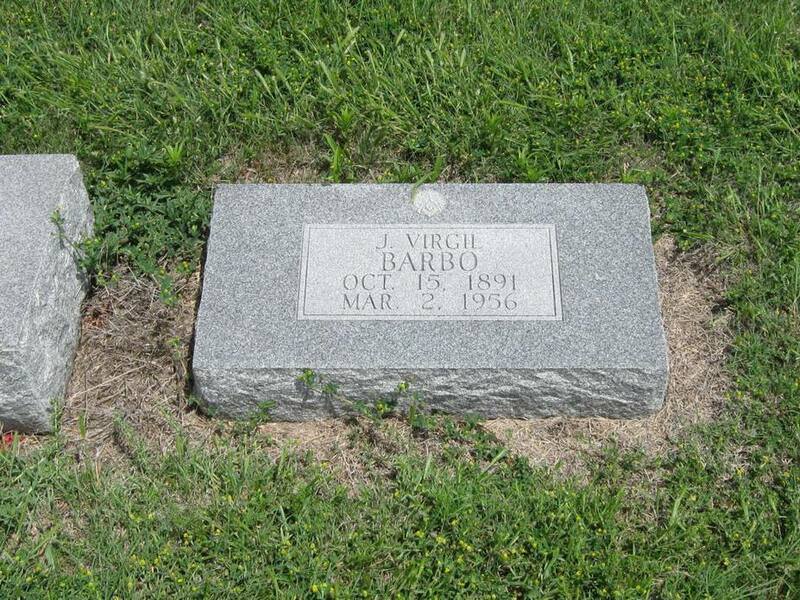 Obit on file at Norton Co. Genealogical Society. Anderson	 Samuel	 1848	 1934	 Father	 Large ANDERSON family stone; individual footstones with names and dates. Masonic Emblem. 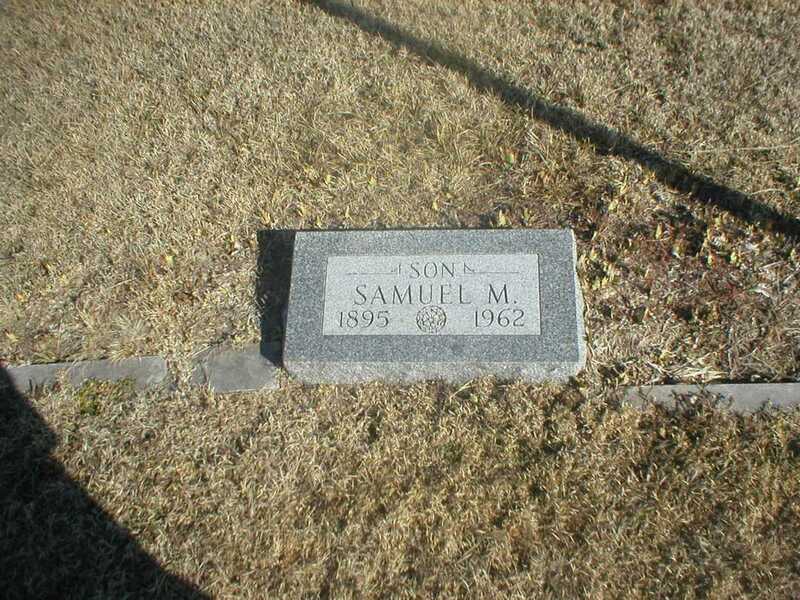 Anderson	 Samuel M.	 1895	 1962	 Son	 Large ANDERSON Headstone individual footstones with names and dates. Arnold	 Martin William	 1/6/1853	 4/7/1911	 Father	 Same stone as Edith May Arnold. Arnold	 Mary Ellen	 1940	 Unmarked. Burial permit on file at Lenora city office; interred 6/15/1940. Age at death was 51 years, 8 months, 5 days. Bacon	 Delia M.	 1896	 1980	 Same stone as W. Ernest Bacon. Daughter of John W. Hayes. American Legion emblem. Bacon	 W. Ernest	 1893	 1942	 Same stone as Delia M. Bacon. Bangerter	 Fritz	 2/21/1887	 4/18/1968	 Military stone; KANSAS; Horseshoer; U.S. ARMY WORLD WAR I	 Same stone as Fred A. Bangerter and Mabel L. Bangerter. American Legion emblem. 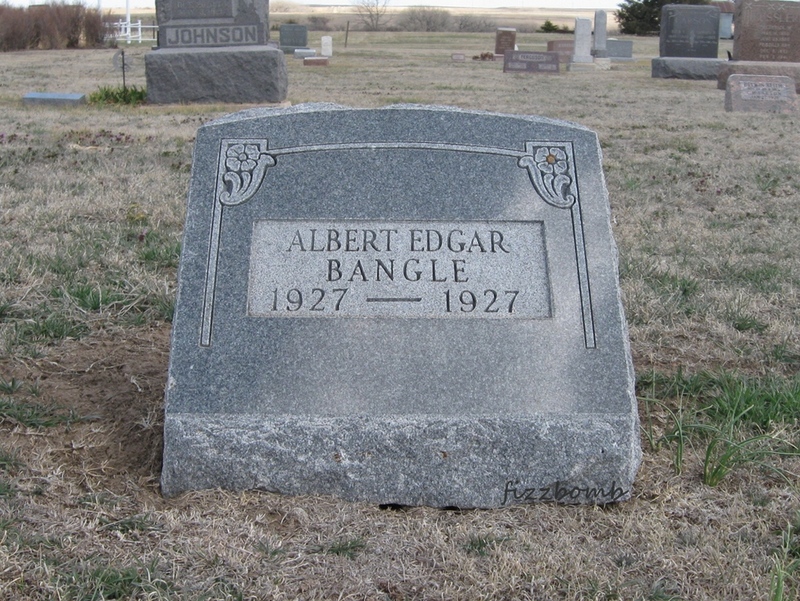 Bangle	 Albert Edgar	 1927	 1927	 Son of Samuel P. and Minnie (Turner) Bangle. 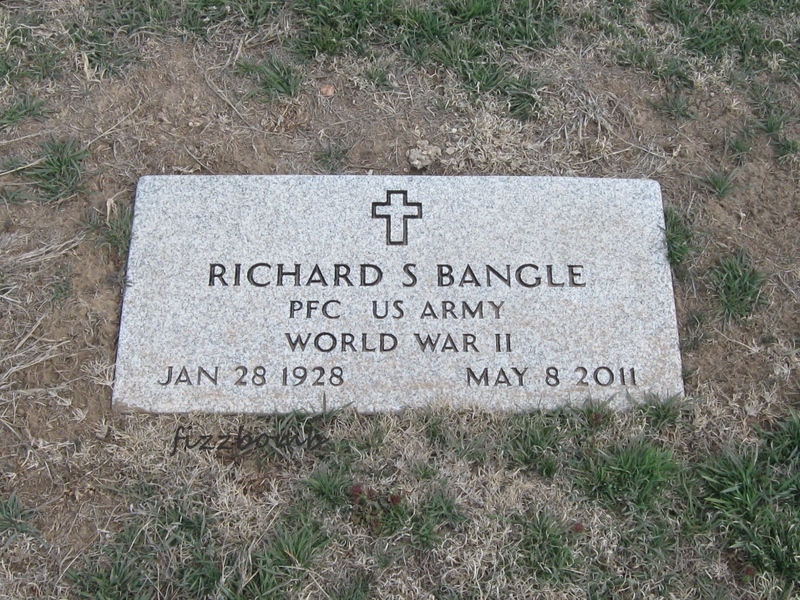 Bangle	 Chester "Chet"	 7/30/1919	 5/7/2001	 PFC U.S. ARMY WWII	 Same stone as Arlene Bangle. 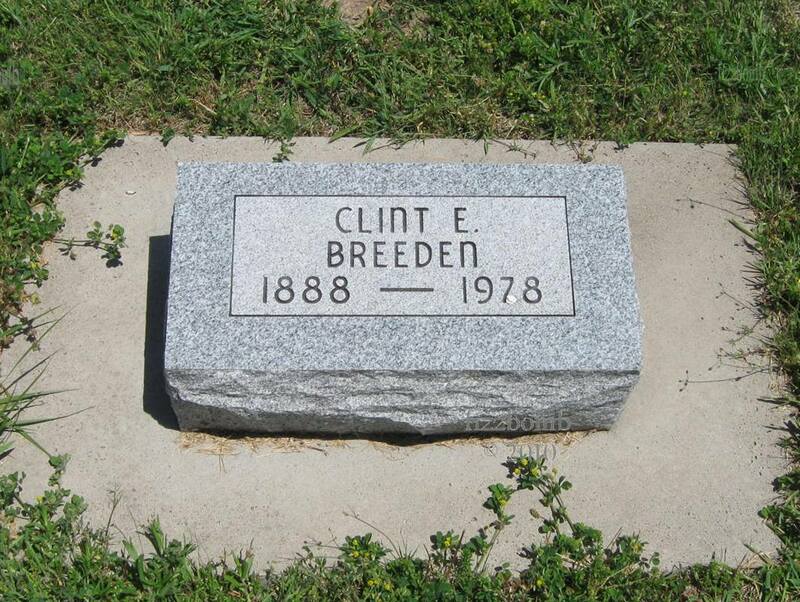 Chet's first wife was Wilma Mae who is buried elsewhere in the cemetery. 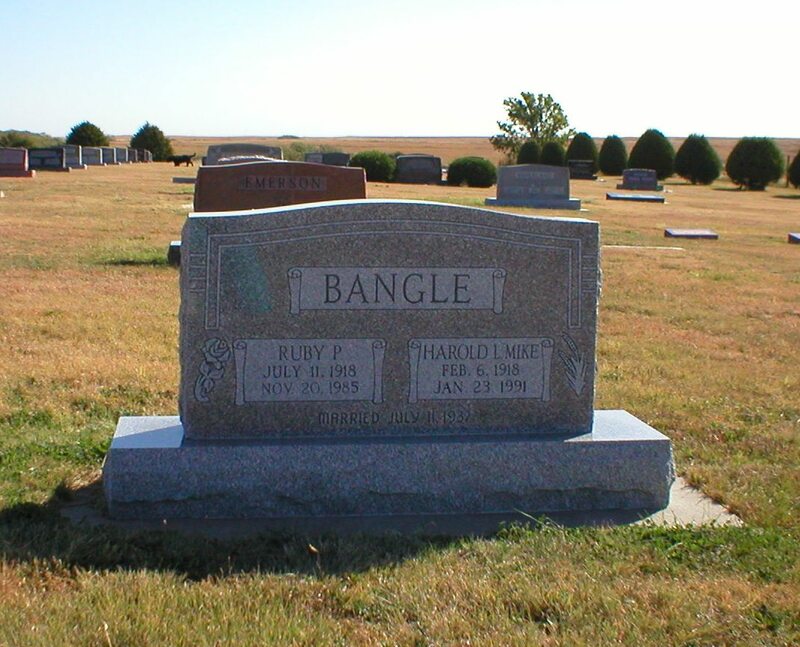 Bangle	 Harold L. "Mike"	 2/6/1918	 1/23/1991	 Married 7/11/1937	 Same stone as Ruby P. Bangle. 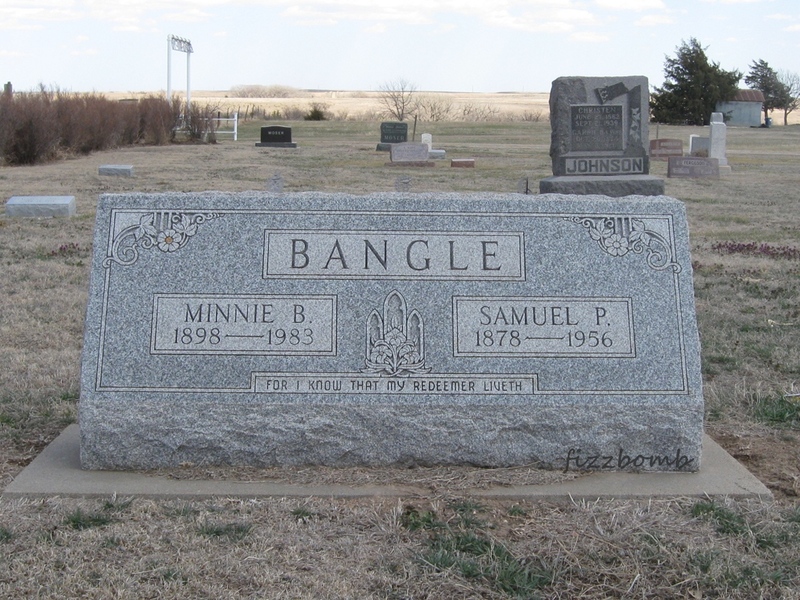 Son of Samuel P. and Minnie (Turner) Bangle. 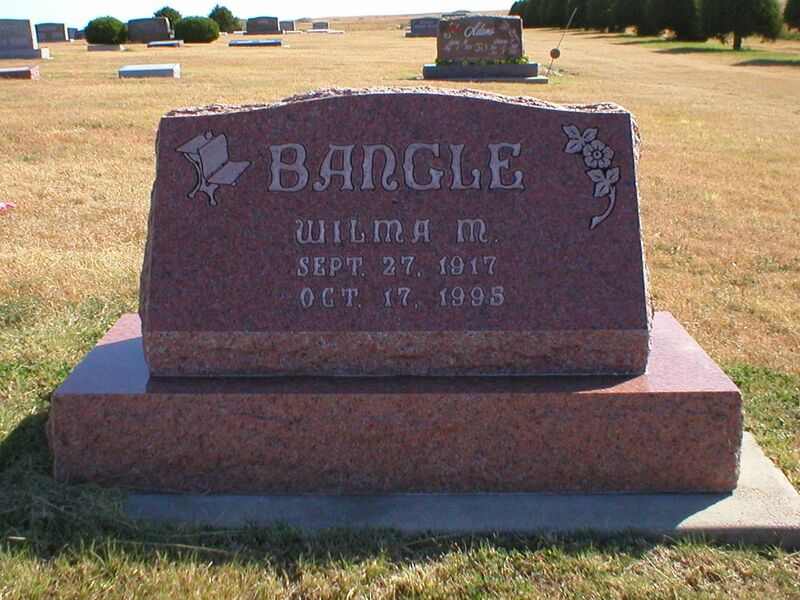 Bangle	 Ilah M.	 5/29/1924	 5/20/2015	 Aug. 2, 1942 (inside wedding rings)	 Same stone as her husband, William Austin Bangle. 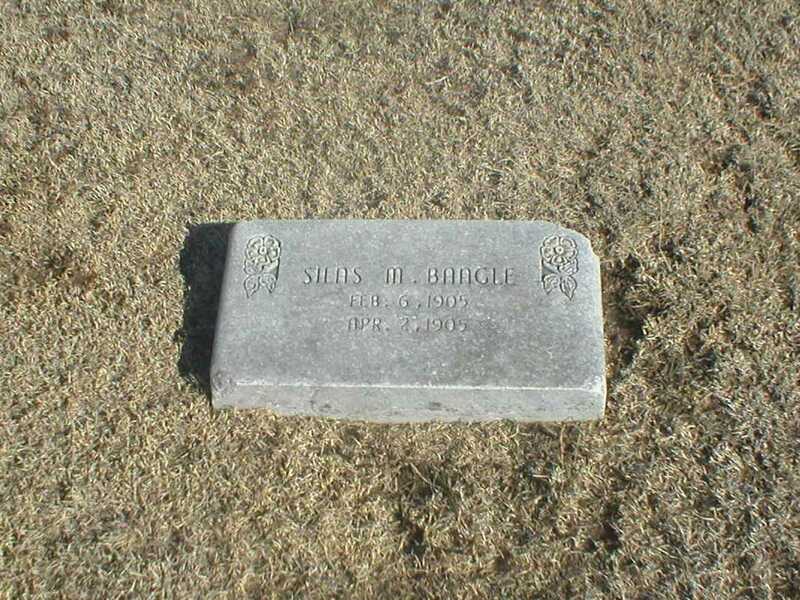 Bangle	 Silas M.	 2/6/1905	 4/12/1905	 Son of Jesse and Alta (Hite) Bangle. Bangle	 William Austin	 8/2/1942	 5/27/2015	 Aug. 2, 1942 (inside wedding rings)	 Same stone as his wife, Ilah M. Bangle. Bangle	 Wilma Mae	 9/27/1917	 10/17/1995	 Back: Wilma and Chet: parents of Dewayne, Mary, Ann	 Maiden name was Lemon. 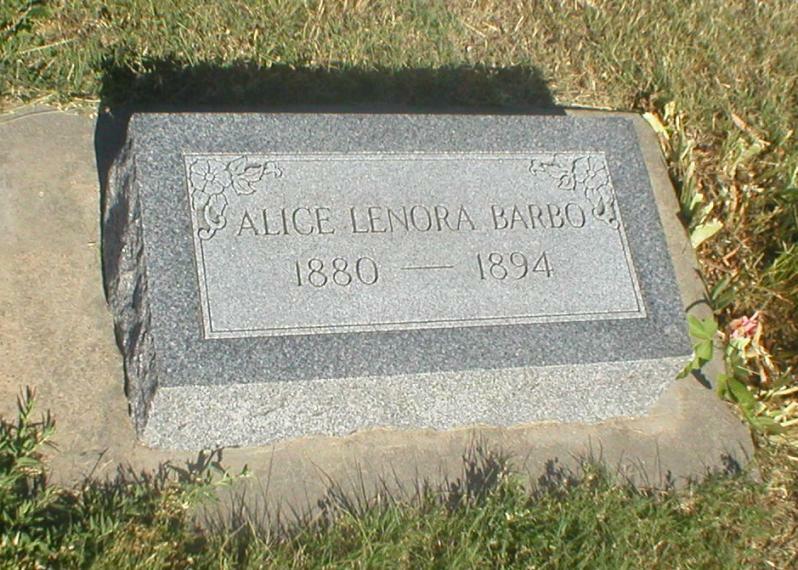 Barbo	 Alice Lenora	 1880	 1894	 All a part of the BARBO plot next east that has several relatives buried in it. 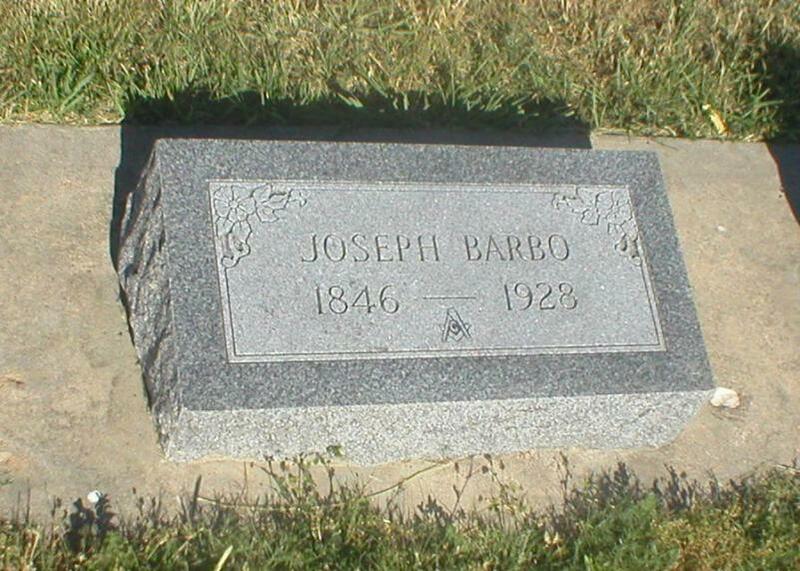 Daughter of Joseph and Marie Octavia (Girard) Barbo. 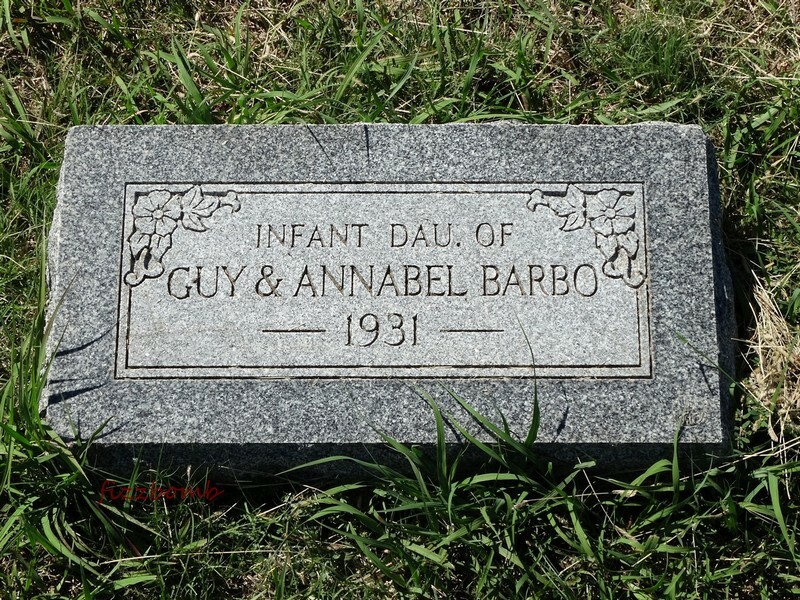 Barbo	 Infant daughter	 1931	 1931	 Infant Daughter of Guy and Annabel Barbo	 Guy Barbo paid 200.00 for perpetual care for lots 37 and 38. Bashford	 Chester G.	 1895	 1956	 Same stone as May G. (Gnagy) Bashford. Bashford	 May G.	 1894	 1984	 Same stone as Chester G. Bashford. Bates	 Edwin Gale	 3/16/1939	 6/25/1973	 Military marker: Kansas PFC US ARMY; 3-16-1939 6-25-1973	 Same stone as James J. Bates and Hazel Bates. Baughman	 Earl	 1898	 1920	 Marine Batt. A 54th Co. 2nd Reg. ; HONOR	 Military marker. Baughman	 Frances M.	 1875	 1954	 Same stone as William R. Baughman. Baughman	 William R.	 1869	 1964	 Same stone as Frances M. Baughman. 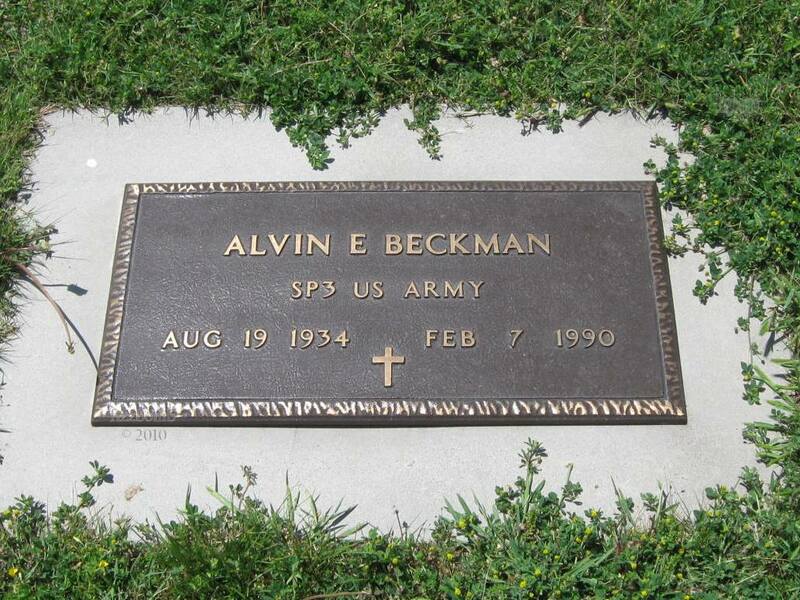 Bebb	 Albert	 10/30/1958	 8/12/2004	 Cenotaph (commemorative stone) only. Cremains held by family. Obituary on file at city office. Becholdt	 R. Esther	 1854	 1932	 Mother	 Her full name was Rachel Esther Martin per her husband's obituary. 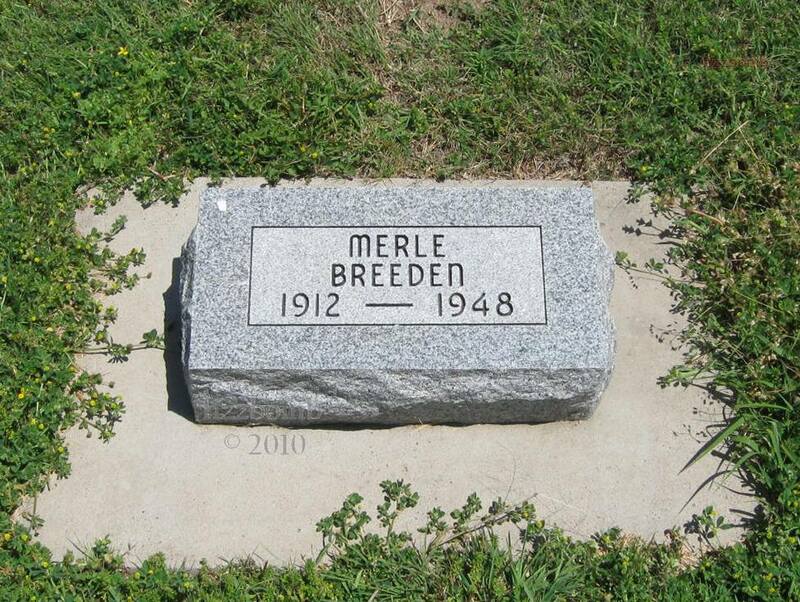 Belden	 Arnold L.	 8/26/1917	 4/26/1938	 Son	 Same stone as Mable J. Belden and Frame H. Belden. Belden	 Frame H.	 1891	 1971	 Father	 Same stone as Mable J. Belden and Arnold L. Belden. 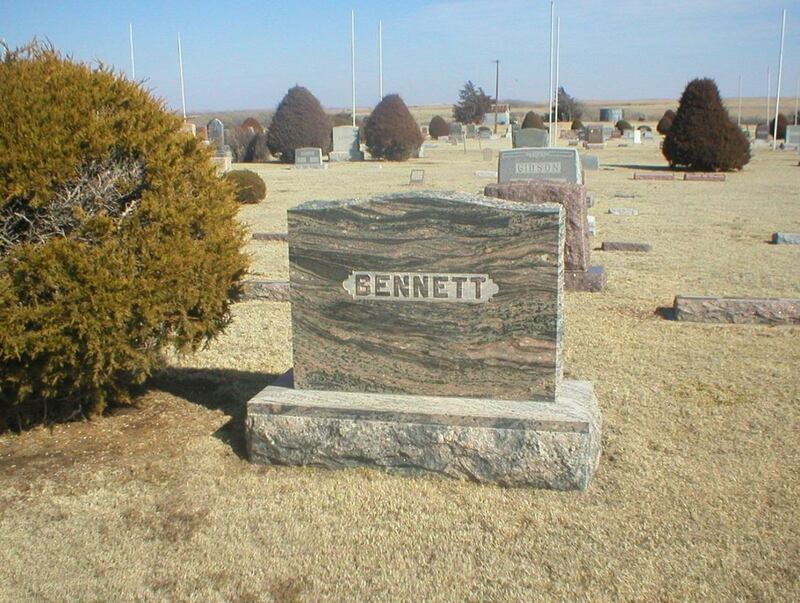 Bennett	 Agnes S.	 11/10/1861	 1/27/1958	 Large BENNETT family stone; individual footstones. 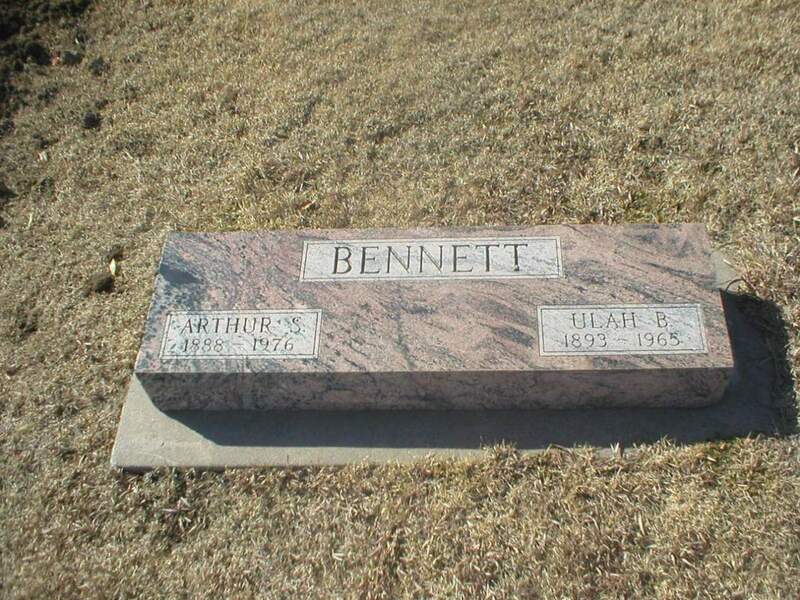 Bennett	 Harley M.	 1886	 1967	 Large BENNETT family stone; Same footstone as Maude H. Bennett. Bennett	 John F.	 4/10/1859	 10/31/1932	 Large BENNETT family stone; individual footstones. 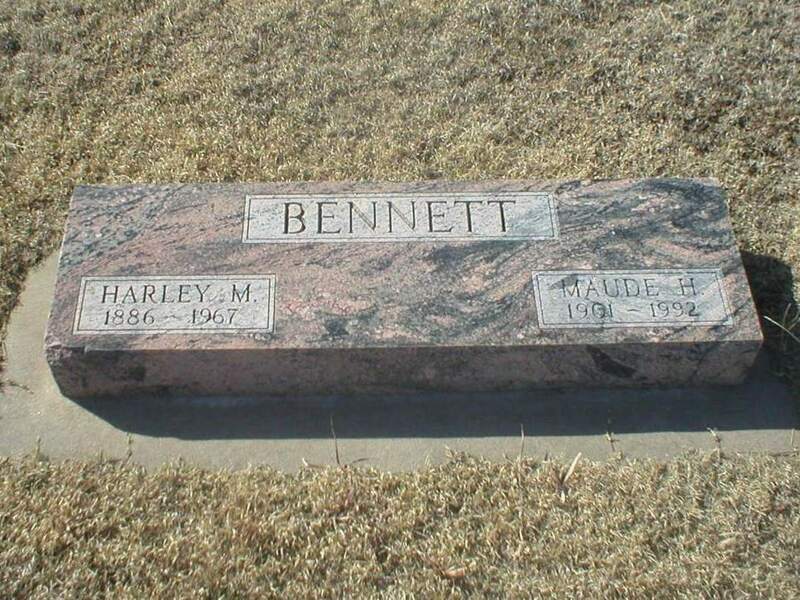 Bennett	 Maude H.	 1901	 1992	 Large BENNETT family stone; shared footstone as Harley M. Bennett. Berry	 Delbert Wayne "Red"	 4/20/1928	 7/28/2013	 Red served on the Lenora Cemetery Association board and was instrumental in many updates to the cemeteries, including the installation of the directories at both Lenora South Cemetery and Lenora East Cemetery. 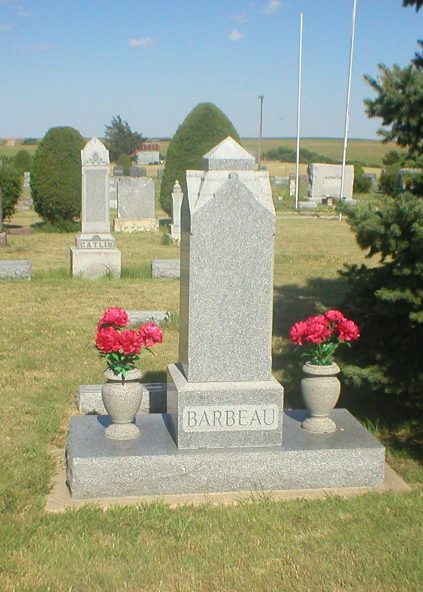 Fittingly, he was the first burial in the new addition on the west of the Lenora South Cemetery. Berry	 Infant	 1937	 1937	 Son of Mr. & Mrs. N.H. Berry	 Single stone commemorating 3 children of Mr. and Mrs. N.H. Berry. Berry	 Infant	 1924	 1924	 Daughter of Mr. & Mrs. N.H. Berry	 Single stone commemorating 3 children of Mr. and Mrs. N.H. Berry. Berry	 Margaret Marie	 1925	 1925	 Infant Daughter of Mr. and Mrs N.H. Berry	 Single stone commemorating 3 children of Mr. and Mrs. N.H. Berry. 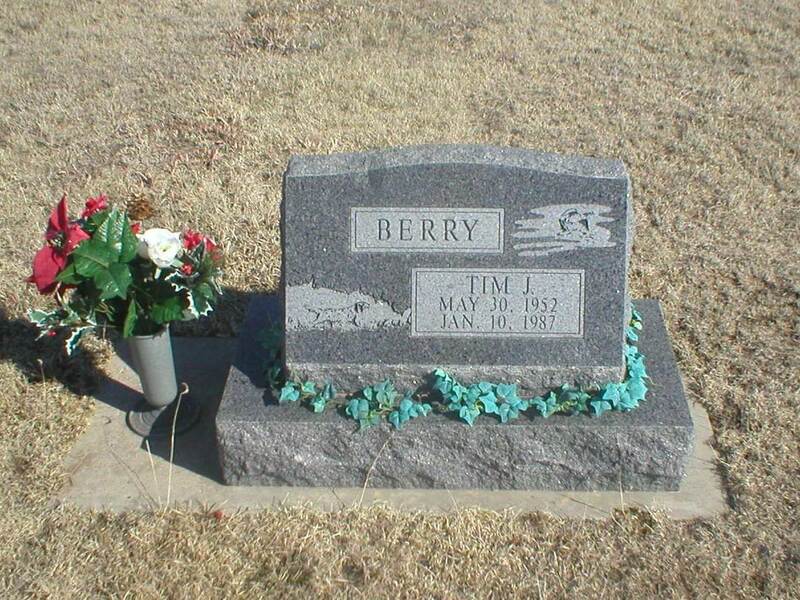 Berry	 Newell H.	 2/20/1900	 11/9/1993	 Married Nov 1, 1922	 Same stone as Fern Berry. 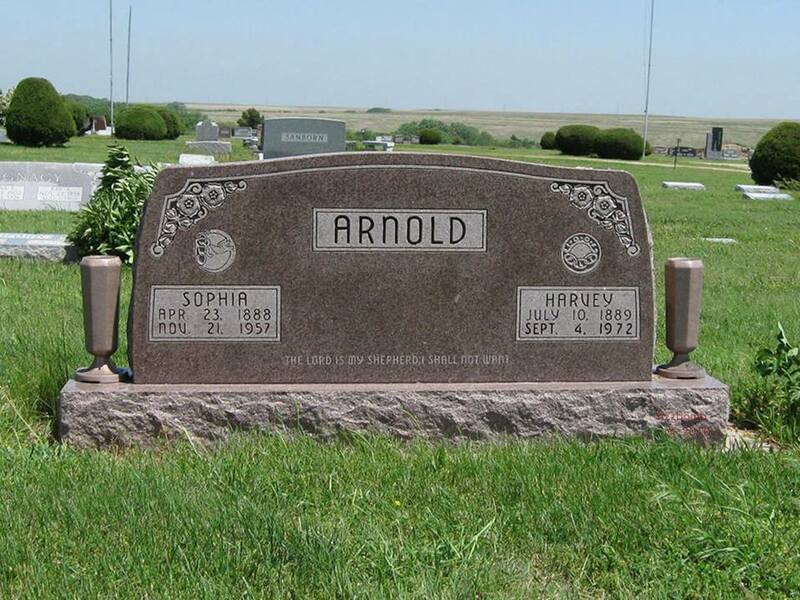 Nickname was "Happy". 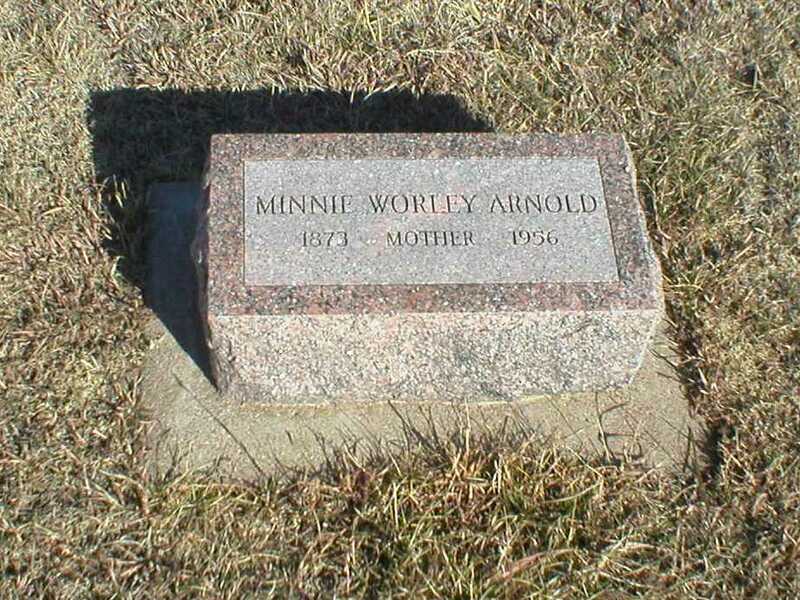 Best	 Corrinne	 8/16/1916	 9/30/2006	 Married 7/16/1936	 Same stone as Riley Best. Back of stone: Parents of Joyce, Lola and Carl. Best	 Riley	 9/8/1913	 11/15/2001	 Married 7/16/1936	 Same stone as Corrinne (Roberts) Best. Back of stone: Parents of Joyce, Lola and Carl. Son of Chester Carl and Pearl (Born) Best. 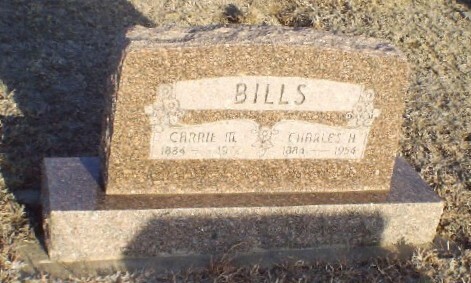 Bills	 Carrie M.	 1884	 1972	 Same stone as Charles H. Bills. 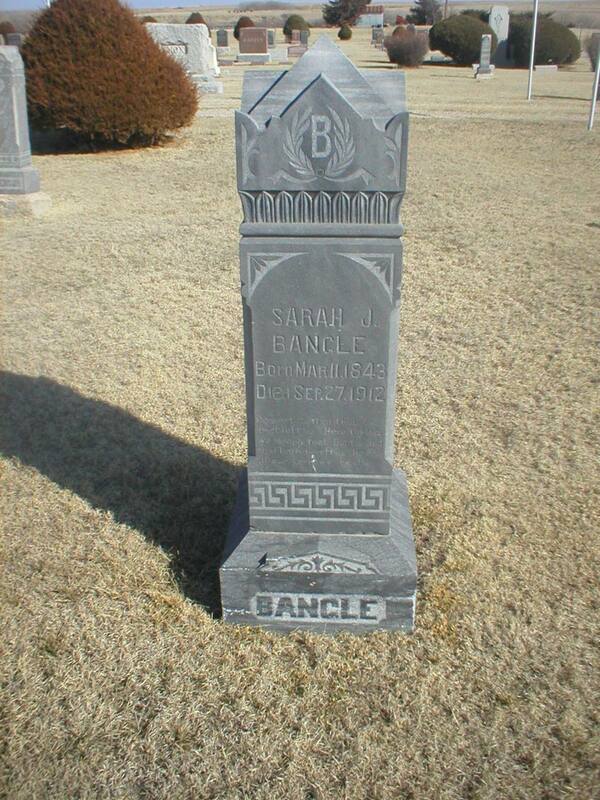 Maiden name was Kennecke. 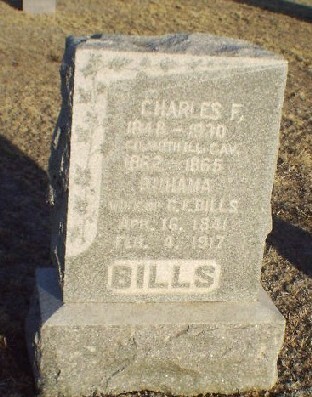 Bills	 Charles H.	 5/18/1884	 5/24/1954	 Same stone as Carrie M. (Kennecke) Bills. Obit on file in city office. Charles' 1st wife (Jessie L. Johnson) and daughter are buried in Block 1 Lot 12. Bills	 Jessie L.	 9/11/1884	 8/1/1907	 Wife of C.H. 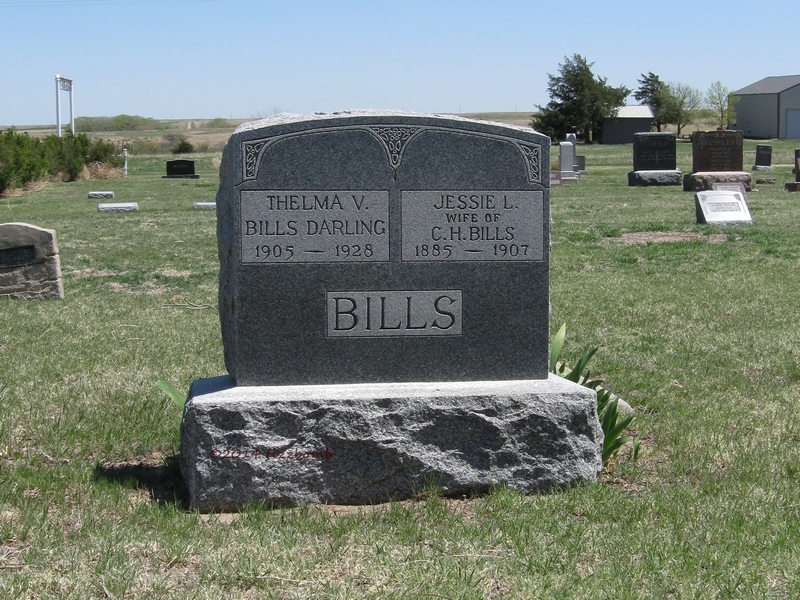 Bills; Aged 22y 10m 19d; Footstone: Mother	 Same stone as Thelma V. (Bills) Darling. Obit on file in city office and Norton Co. Genealogical Society. 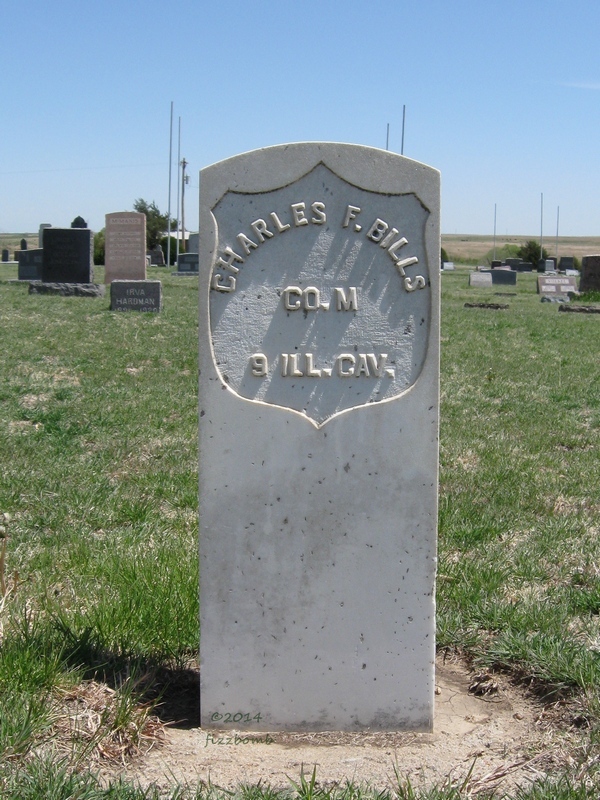 First wife of Charles H. Bills. 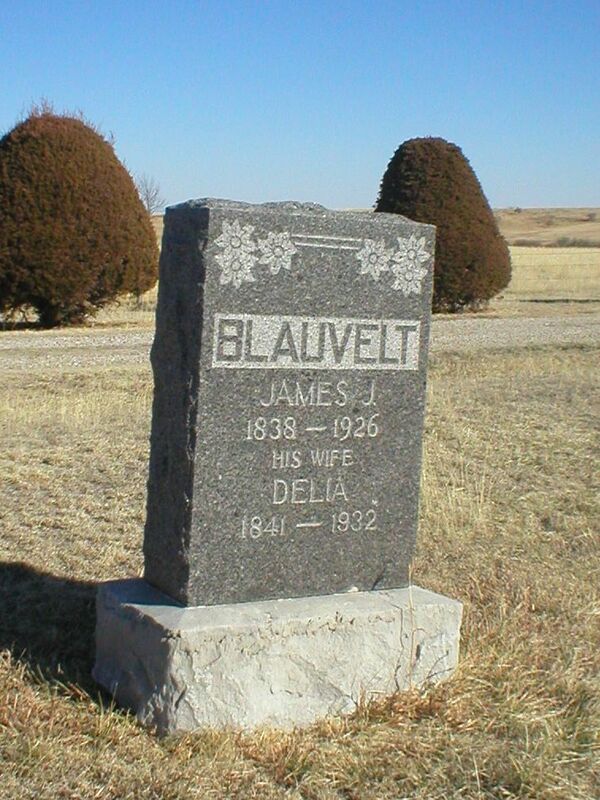 Blauvelt	 Delia	 1841	 1932	 His Wife	 Same stone as James J. Blauvelt. Blauvelt	 Irving Hudson	 4/1937	 Aged 72y 5m 28d	 Cemetery records indicate burial; no stone. Blauvelt	 James J. 1838	 1926	 Same stone as Delia Blauvelt. 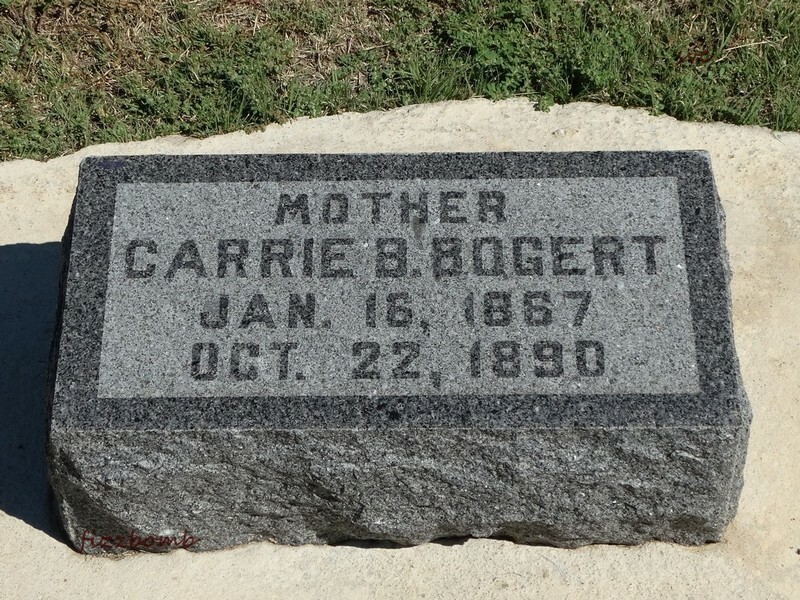 Bogert	 Carrie B. 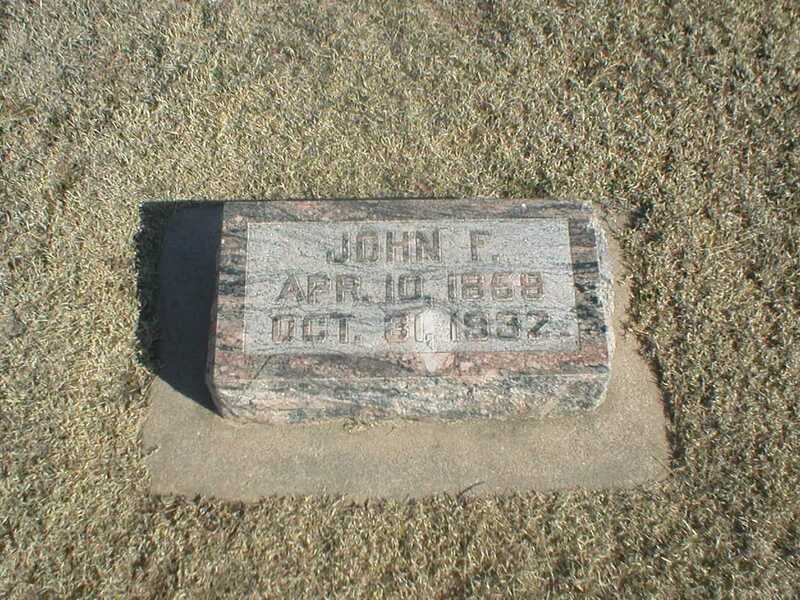 1/16/1867	 10/12/1890	 Stone faces opposite direction from all others in row. 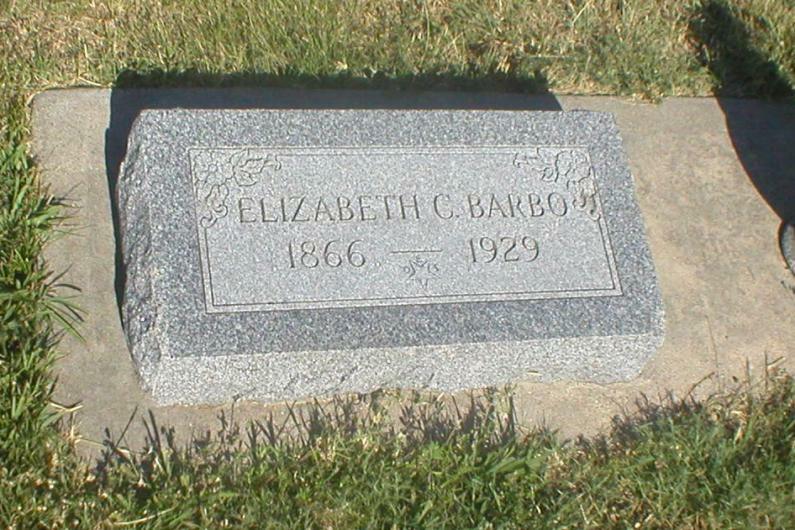 Booth	 Albert H.	 1843	 1904	 Father	 Same stone as Sylvia V. Booth. Booth	 Ernest	 Children of L.L. 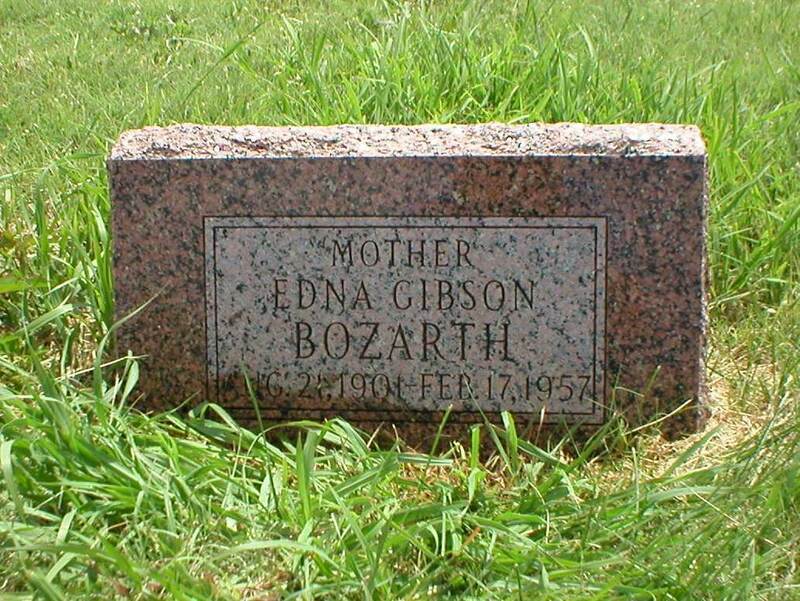 Booth	 Same stone as Gertrude and Helen Booth.� Children of Louis and Nora (Fix) Booth. Booth	 Helen	 Children of L.L. 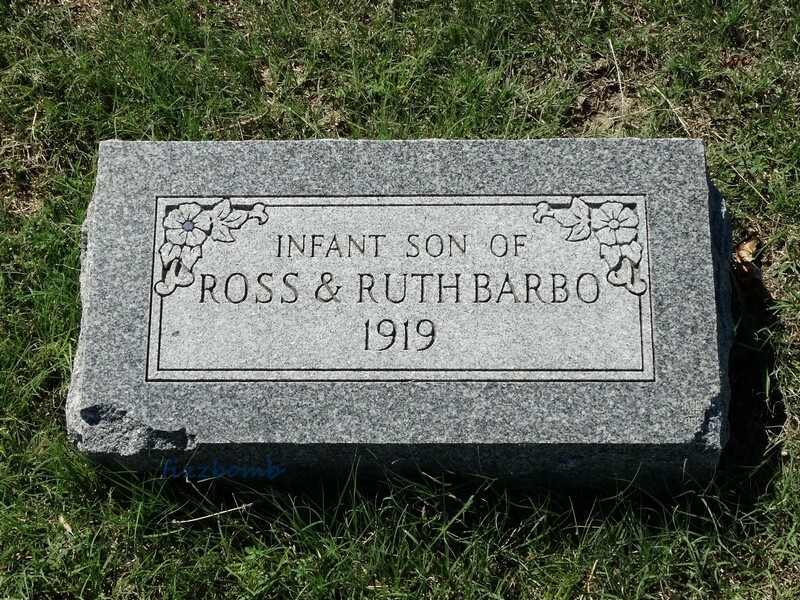 Booth	 Same stone as Ernest and Gertrude Booth.� Children of Louis and Nora (Fix) Booth. Booth	 Pearl B. 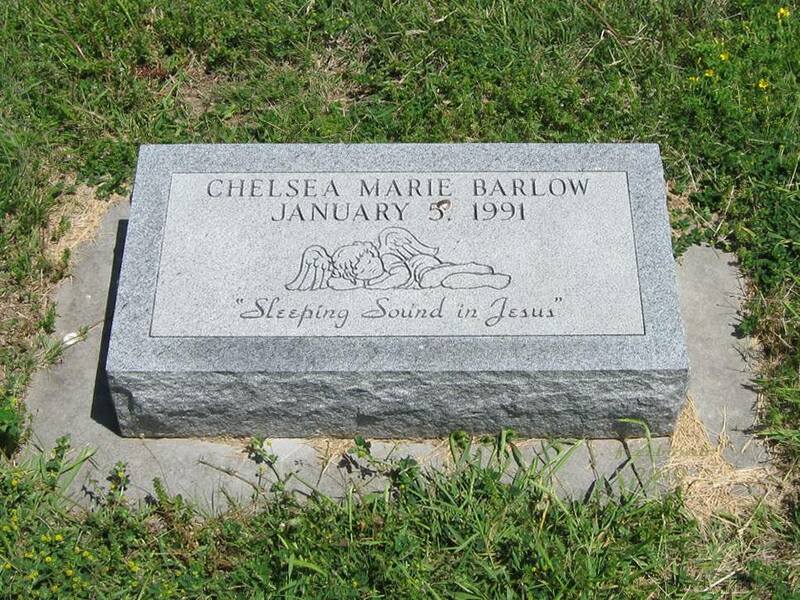 3/12/1898	 3/17/1993	 Same stone as William Booth. Booth	 William	 3/22/1886	 10/29/1957	 Same stone as Pearl B. Booth. 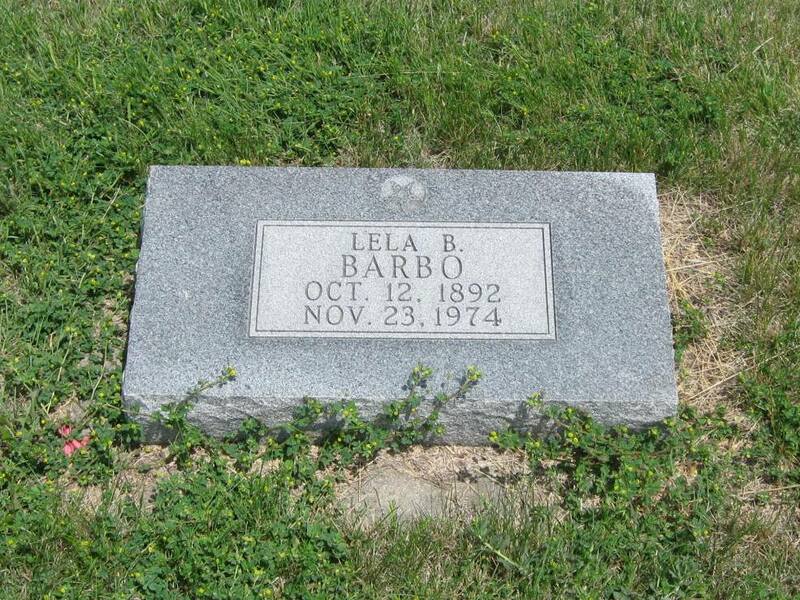 Born	 Beulah	 7/11/1919	 8/18/1996	 Wife of Lyle Duane Born. 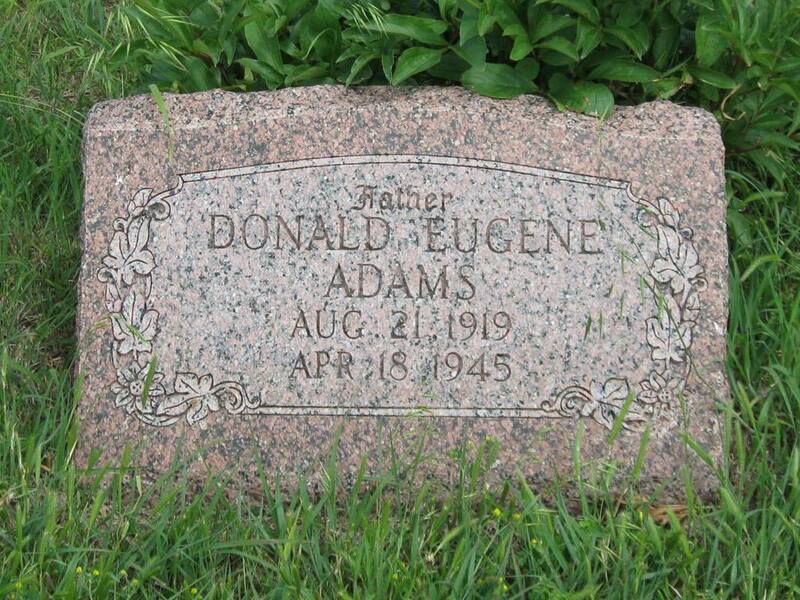 Born	 Duane	 12/24/1923	 1/28/1995	 Son of Earl & Edith (Seltzer) Born. Botts	 Ardie Winfred	 1899	 1899	 Son of Mr. & Mrs S.J. Botts	 In line with Botts stones from next row east. Botts	 Ellen E.	 6/3/1837	 6/27/1893	 Mother	 Stones are at the far east end of lot so they apper to be in the row immediately east. Bowen	 Carl H.	 1912	 1995	 IOOF	 Same stone as Florence L. Bowen. Bowen	 Charles Dean	 7/7/1930	 5/10/1993	 Married Feb 16, 1957; Parents of Jodene (Jody), Charlene (Shelly) & Douglas (Doug)	 Same stone as (living) Bowen. American Legion flag holder. 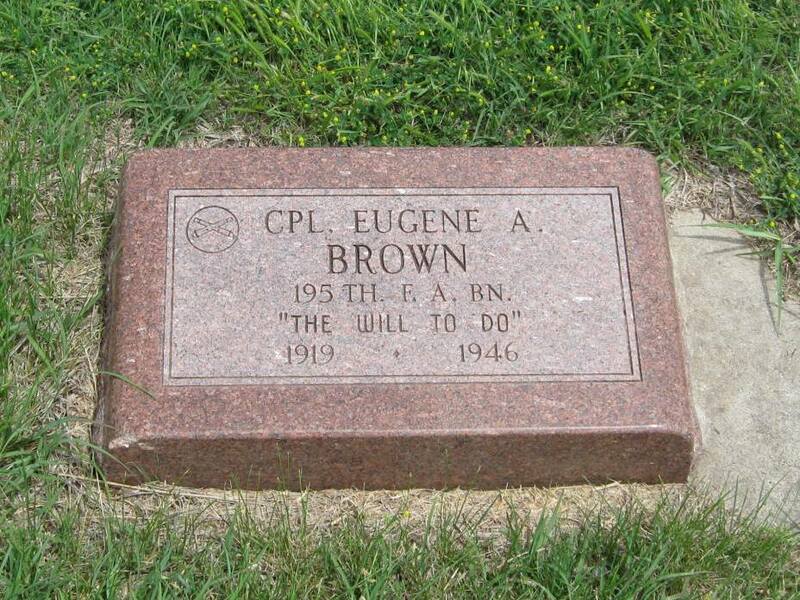 Bowen	 Florence L.	 1910	 2000	 Same stone as Carl H. Bowen. 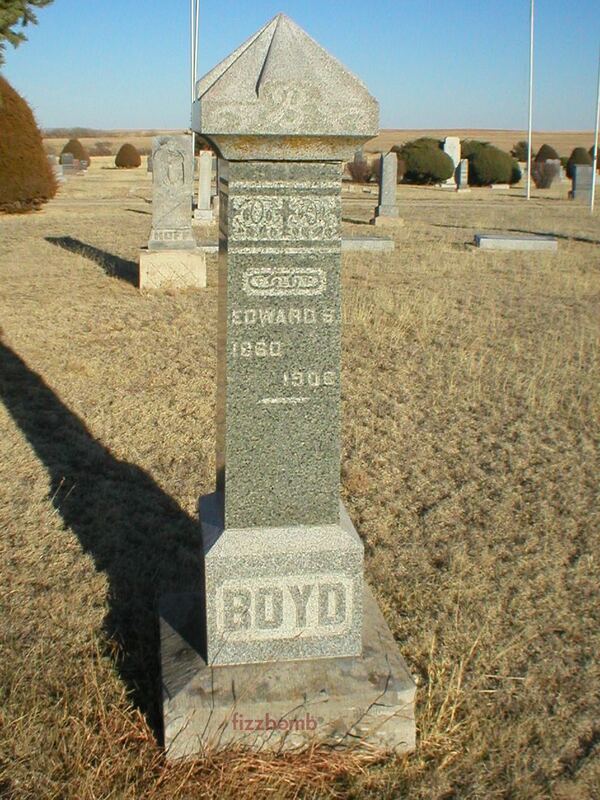 Boyd	 Edward S.	 1860	 1906	 Oddfellow emblem. 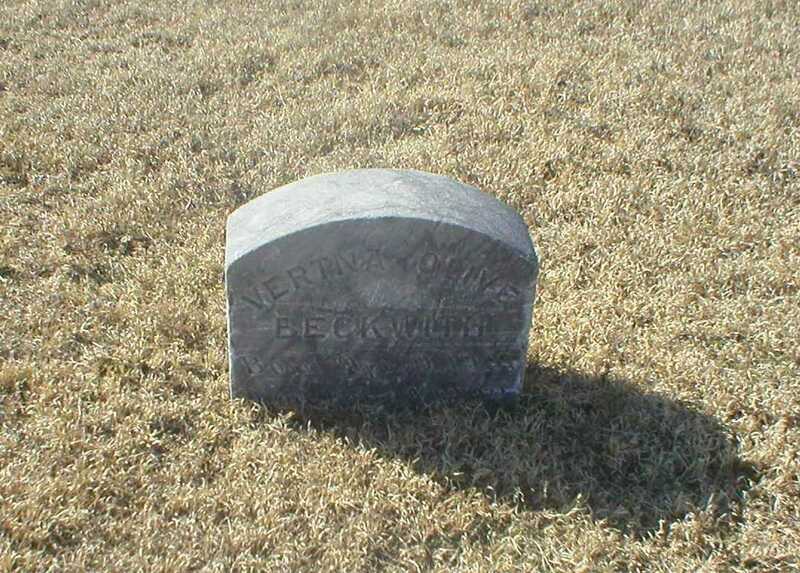 Bozarth	 Frank F.	 1873	 1940	 Same stone as Mary Etta (McClellan) Bozarth. FTL emblem. 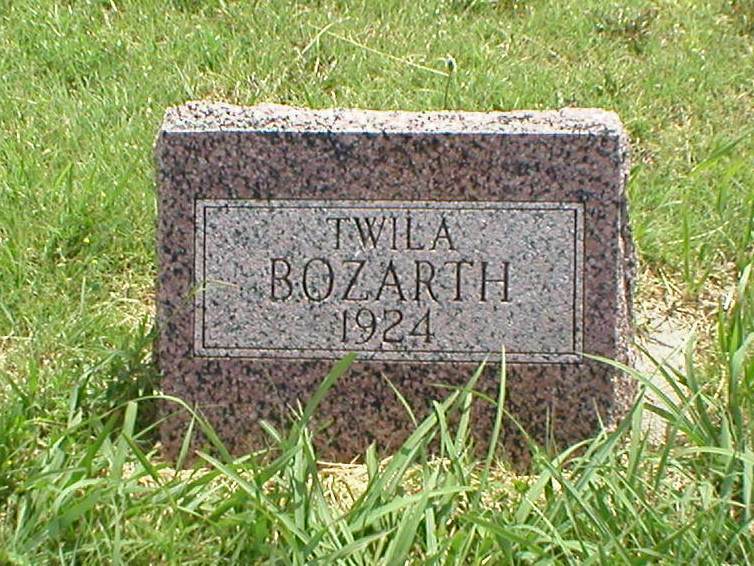 Son of John Perry and Eliza Jane (Miller) Bozarth. Obit. 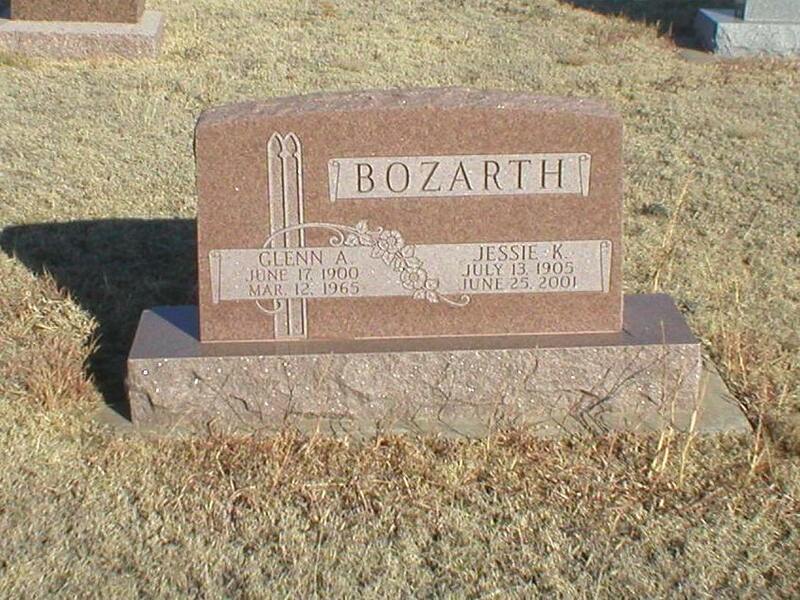 Bozarth	 Jessie K.	 7/13/1905	 6/25/2001	 Same stone as Glenn A. Bozarth. 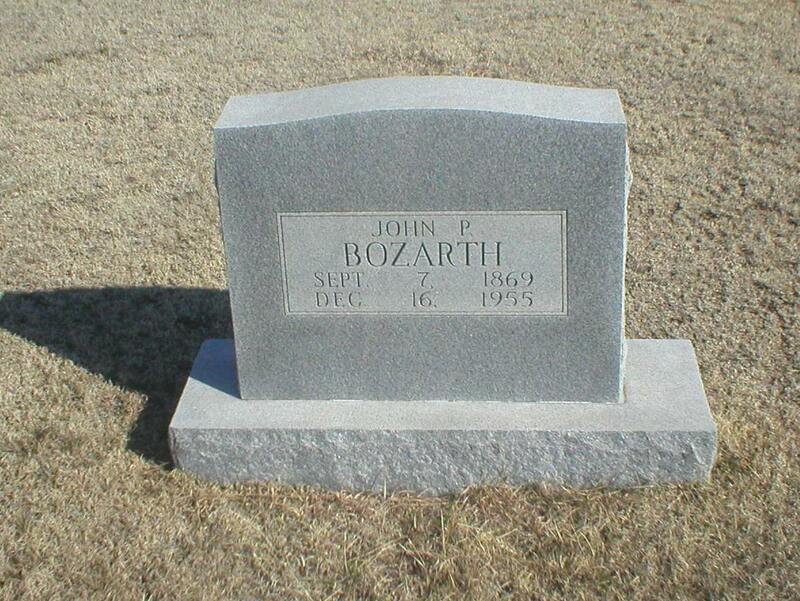 Bozarth	 John P.	 9/7/1869	 12/16/1955	 Son of John Perry and Eliza Jane (Miller) Bozarth. 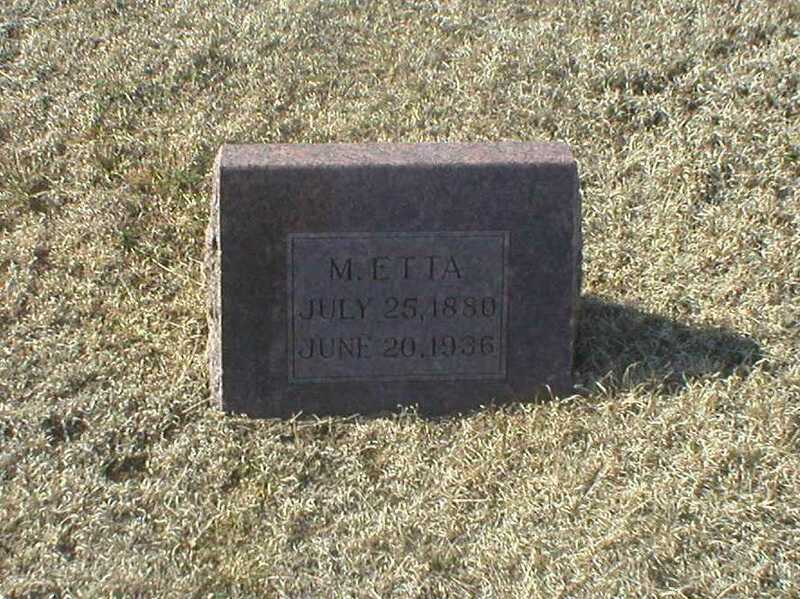 Bozarth	 M. Etta	 7/25/1880	 6/20/1936	 Mary Etta McClellan, wife of Royal Benjamin Bozarth. Large center BOZARTH stone; individual information on footstones. Rebekah emblem. Maiden name McClellan. 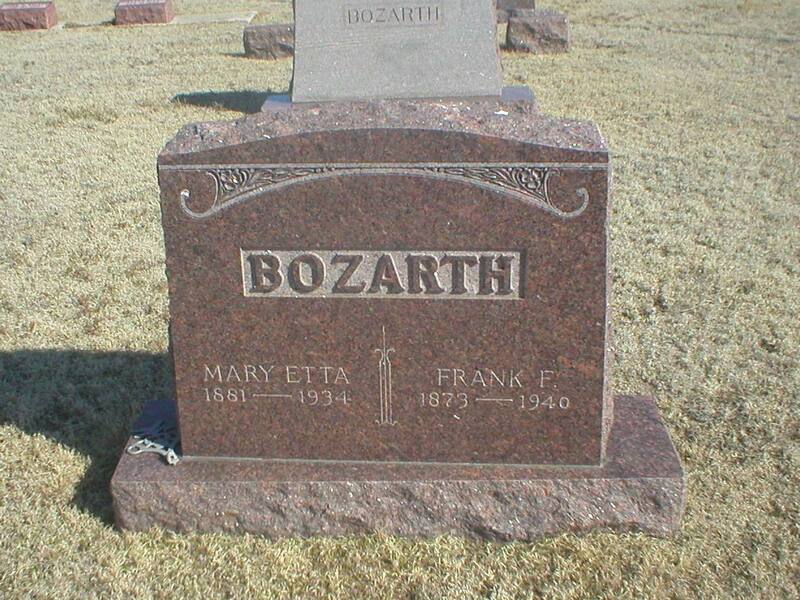 Bozarth	 Mary Etta	 1881	 1934	 Same stone as Frank F. Bozarth. FTL emblem. Maiden name Hendricks. Obit. 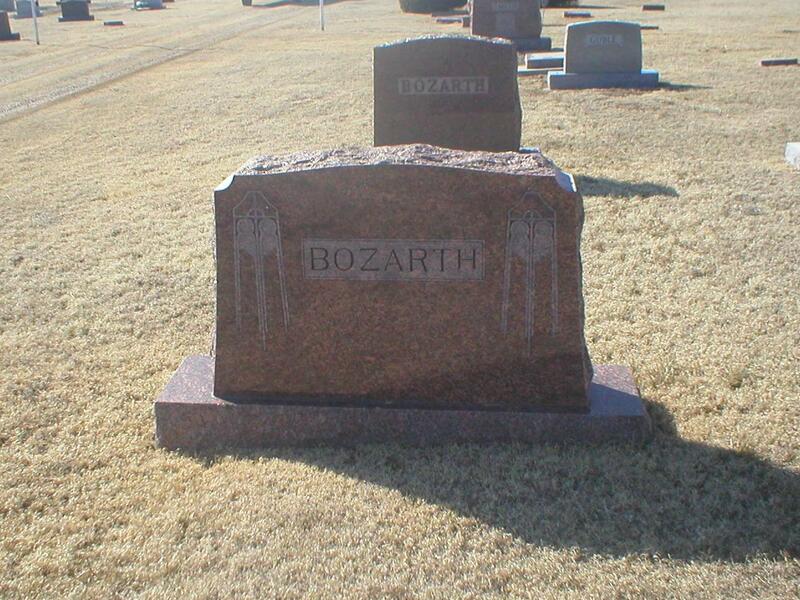 Bozarth	 Roy B. 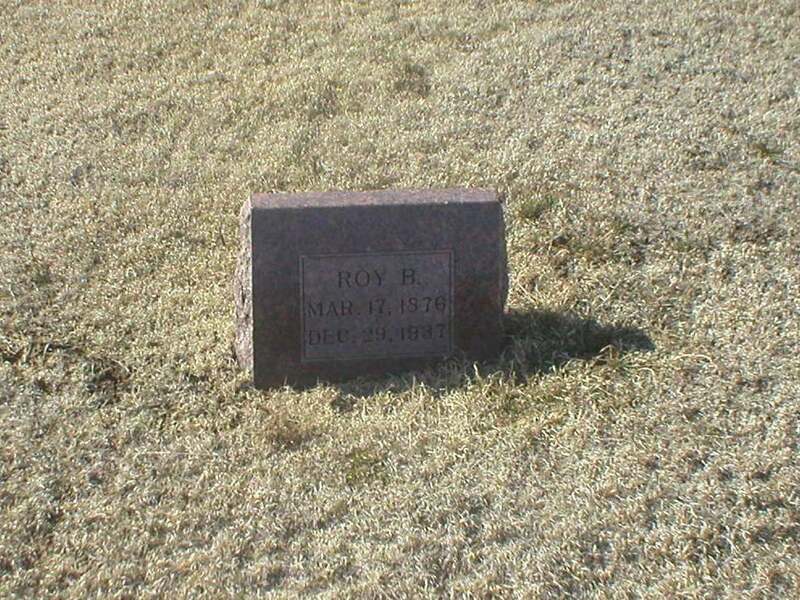 3/17/1876	 12/29/1937	 Large center BOZARTH stone; individual information on footstones. Royal Benjamin Bozarth, son of John Perry and Eliza Jane (Miller) Bozarth. 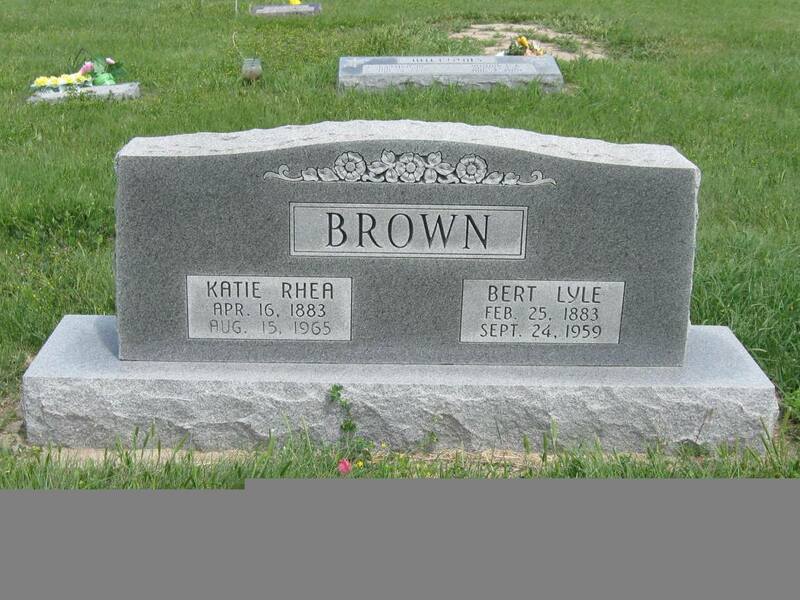 Brown	 Bert Lyle	 2/25/1883	 9/24/1959	 Same stone as Katie Rhea Brown. 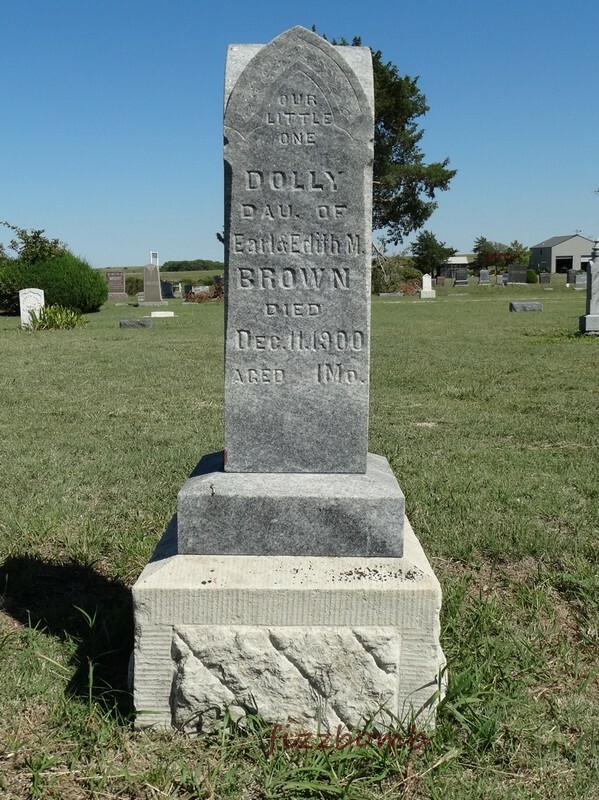 Brown	 Emaline	 1847	 1916	 Same stone as Thomas J. Brown. 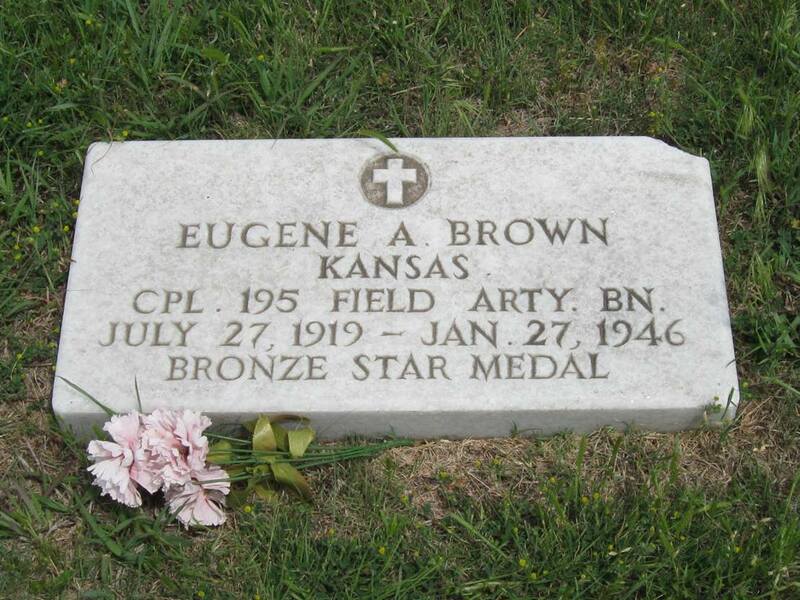 Brown	 Roy Kenneth	 3/17/1913	 6/17/1913	 Unmarked. 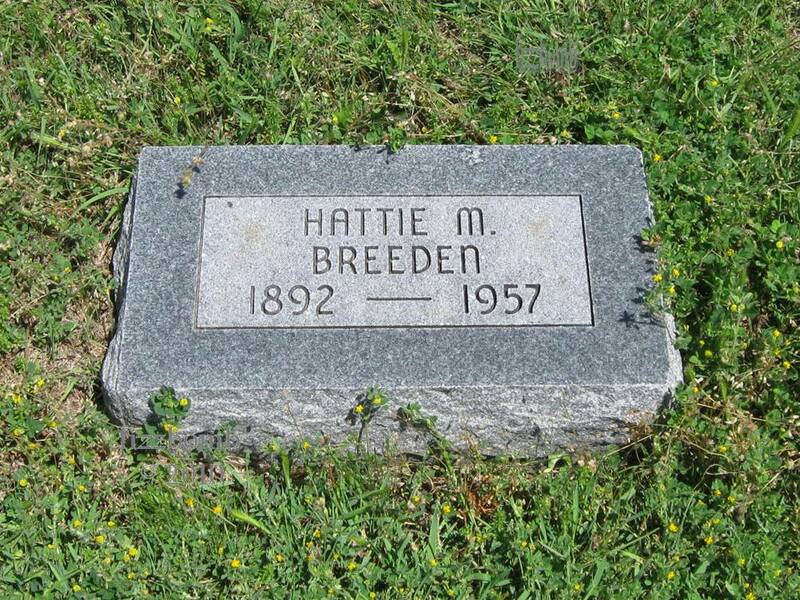 Son of L. H. & Madeline Brown. Death notice and funeral record on file in city office. Brown	 Thomas J. 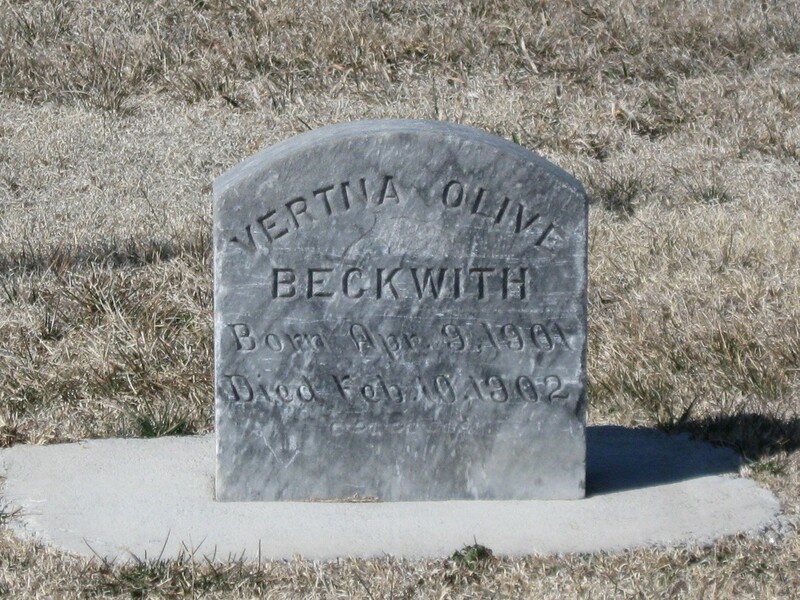 1843	 1917	 Same stone as Emaline Brown. Bull	 Dora	 1860	 1932	 Same stone as Charles Bull. Picture of couple on the stone. 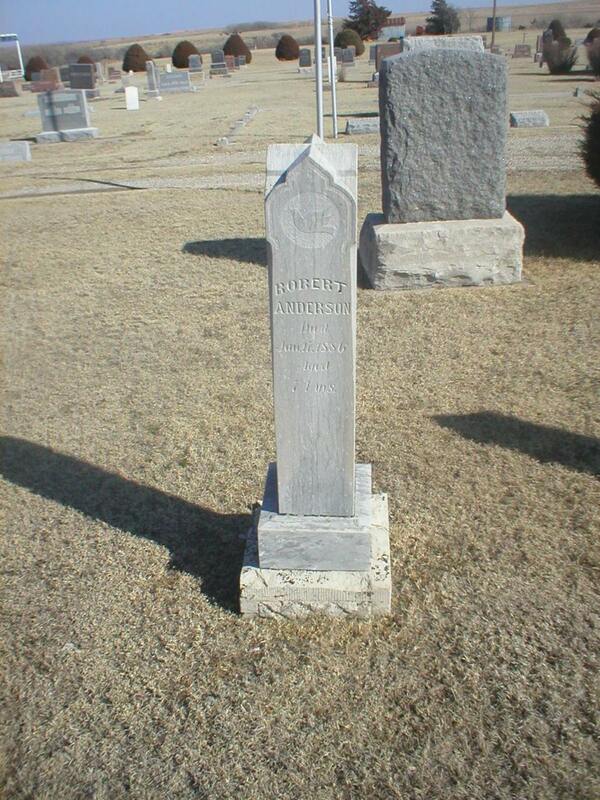 Burge	 Charles Chance	 4/3/1873	 11/1/1952	 Cemetery records indicate burial; no stone. Obit on file in city office. Occasional minister at the local Church of God.